We’d love your help. Let us know what’s wrong with this preview of Wallpaper by Thao Lam. To ask other readers questions about Wallpaper, please sign up. Nearly wordless. Colorful and imaginative rendered in detailed papercuts. Wallpaper was a beautiful wordless picture book about one little girl feeling sad and left out while the other children are playing outdoors. She discovers a little tear in the wallpaper in her room where a bird escapes from. As she peels back the layers of wallpaper, she discovers more adventures waiting for her from birds and rainforests to monsters, frogs, sheep and eventually friends. Courage erupts after her adventures and friendship making in the wallpaper. It is a beautifully created idea Wallpaper was a beautiful wordless picture book about one little girl feeling sad and left out while the other children are playing outdoors. She discovers a little tear in the wallpaper in her room where a bird escapes from. As she peels back the layers of wallpaper, she discovers more adventures waiting for her from birds and rainforests to monsters, frogs, sheep and eventually friends. Courage erupts after her adventures and friendship making in the wallpaper. This wordless picture book would make a fine learning tool for story telling with little ones and big ones! Very creative telling on how to make friends! Love the art work! I received a free advance Kindle copy from Netgalley in exchange for a fair review. Mostly wordless book with strong illustrations. Some interesting twists and turns in this story. I read about this book on a list of books to help children deal with big emotions. The review mentioned how the girl in the book is very shy and the book traced her growth from too shy to speak to her new neighbors to, ultimately, being brave enough to wave hello. I heard the description and thought that it was something that very shy L definitely needed to read. I will say that both of my kids prefer picture books with text to wordless picture books (this one is almost wordless). And L, of cour I read about this book on a list of books to help children deal with big emotions. The review mentioned how the girl in the book is very shy and the book traced her growth from too shy to speak to her new neighbors to, ultimately, being brave enough to wave hello. I heard the description and thought that it was something that very shy L definitely needed to read. In this nearly-wordless picture book, a young girl is too shy to speak to new neighbor kids and instead gets courage from an imaginary foray into her room's wallpaper (it's a fun and whimsical jaunt, nothing like The Yellow Wallpaper!). Thao Lam's cut-paper collages look enticingly 3D. This sentence from Publisher's Weekly made me especially want to read it: "Lam’s rich visual storytelling illuminates the way that children’s internal lives help them move through loss and anxiety." This book had me at hello, so to speak. I'm huge fan of wallpaper/printed papers, as well as collage. The endpaper hint at a turned-up corner revealing another world is another plus. Shyness is dealt with in many picture books, but this wordless exploration of an inner imaginative life serving to build confidence and curiosity feels fresh and effective to me. The encouragement for a shy audience to find themselves in the pages of this book makes it a must-have for every setting. A little girl moves and faces the challenge of making new friends. Peeling back the many layers of wallpaper reveals whole worlds underneath that she didn't know were there. A wonderful story of bravery in new situations and looking beyond our assumptions. Marvelous paper-cut illustrations look three-dimensional. This is a fabulous wordless graphic novel. Yes, a graphic novel, with amazing paper cut graphics. It tells the story of the new girl in town how goes on a grand adventure through the wall paper in her room. It’s amazing. Pick it up, you and your kids won’t be disappointed. I just love the texture and colors of the collages contained in this book! Amazing! A stunning exploration of imagination with a classic, timeless feel. This book will remind adult readers of some of the favorites of their childhood. With vibrant illustrations, Thao Lam challenges readers to explore the depths of their imagination in considering what a young girl might feel while staring at wallpaper after a move. This beautiful wordless picture book is the epitome of talent - starring Thao Lam's signature paper collage style illustrations. A shy young girl moves into a new home, and being new, doesn't know any of the kids in her neighbourhood. She can hear them chatting and playing outside her window but she is too shy and apprehensive to go outside and meet them. She feels so lonely and sad. She retreats to her room and idly starts scratching away at her wallpaper. As the tear gets bigger she discovers This beautiful wordless picture book is the epitome of talent - starring Thao Lam's signature paper collage style illustrations. She feels so lonely and sad. She retreats to her room and idly starts scratching away at her wallpaper. As the tear gets bigger she discovers a portal into a magical world of strange characters and exciting adventures. While visiting there she interacts with flying birds, frogs splashing about in their pond, and a flock of funky looking sheep. Then the unthinkable happens... she finds herself in danger (or so she imagines) by an alien-like monster who starts chasing her. Oh my! She is very frightened and runs to get away from him. Then it dons on her that he is not threatening her at all but only wants to befriend her. She does an about turn and bravely approaches him and says "hello!" Thereafter they romp and interact and have a wonderful happy playtime together. When she returns to her reality in her bedroom she discovers she has been emboldened by the wallpaper encounters and with a courageous heart she approaches the kids outdoors and says, "hello!" This book is perfect to share and discuss. It will encourage and inspire kids to overcome their fears, overpower obstacles and step out into life and say "hello!" The illustrations are truly amazing and I love the interaction between the little girl's imagination and her reality. "Wallpaper" is creative on so many levels and a book I highly recommend. 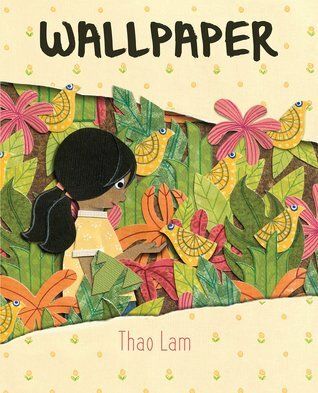 Wordless picturebooks should not be overlooked, and Lam's "Wallpaper" is no exception. Flowing through the pages of this book takes readers on an emotional journey of how a young girl finds a sense of courage. As someone who is an ultimate introvert and occasionally feels the plight of social anxiety, I felt such kinship to our protagonist. The young girl sees other kids playing in a tree house outside her bedroom window, but quickly hides when they spot her. In her shyness, the girl begins to p Wordless picturebooks should not be overlooked, and Lam's "Wallpaper" is no exception. Flowing through the pages of this book takes readers on an emotional journey of how a young girl finds a sense of courage. As someone who is an ultimate introvert and occasionally feels the plight of social anxiety, I felt such kinship to our protagonist. The young girl sees other kids playing in a tree house outside her bedroom window, but quickly hides when they spot her. In her shyness, the girl begins to peel back layers and layers of wallpaper in her bedroom, eventually finding a whole world, complete with imaginary friend. However, after eating lunch, the young girl finds her imaginary friend has left. Realizing her courage and desire for friendship, this brave protagonist treads outside to say hello to the children in the tree house. Lam does a brilliant job sharing this story through illustrations, including the use of graphic novel-like gutters. The subtleties in changing facial expressions and body language capture the changes in characters' emotions and propel the story forward. Meanwhile, unlike the popular wordless picturebook "Sidewalk Flowers," "Wallpaper" uses a vast array of colour throughout the book, which helps readers jump into the mind and imagination of our young protagonist. Overall, this is a brilliant new picturebook that readers both young and old will enjoy. A little girl who has just moved in is eyeing kids next door having fun but is too scared to go over there. She notices a part of the wall paper is peeling back and peeks underneath it…only to find a strange new world where she learns that strangers may not be scary monsters but future friends just waiting for you to say hello. This book is almost entirely wordless. There are a few sound words, and one hello. That’s it. The rest of the story is told through Lam’s brilliant and imaginative collage A little girl who has just moved in is eyeing kids next door having fun but is too scared to go over there. She notices a part of the wall paper is peeling back and peeks underneath it…only to find a strange new world where she learns that strangers may not be scary monsters but future friends just waiting for you to say hello. This book is almost entirely wordless. There are a few sound words, and one hello. That’s it. The rest of the story is told through Lam’s brilliant and imaginative collages. Meeting new people comes naturally for some kids (to the point their parents wish they wouldn’t say hello to every single stranger that crosses their path) whereas other kids struggle with gathering the courage to say hello. This book uses symbolism to communicate their very real emotions about meeting new people (and some adults’ too) and encourages them to at least try saying hello. As an introvert I definitely understand this little girl, but I also agree with the message. Don’t miss out on great potential friendships because of fear. So use this book to help encourage the little introverts around you and/or the kids who have moved one too many times and find it hard to make the effort to start new friendships. This wordless picture book tells the story of a little girl who moves to a new town. As the is unpacking her boxes, she hears talking outside her window and looks out to see three children in a treehouse next door. When they spot her, they wave but she ducks out of sight, shy to meet them. As she sits under her window, a small yellow bird made of wallpaper emerges from a tear in the room’s wallpaper. It flies out the window and the little girl peels more of the paper away and a flock of yellow b This wordless picture book tells the story of a little girl who moves to a new town. As the is unpacking her boxes, she hears talking outside her window and looks out to see three children in a treehouse next door. When they spot her, they wave but she ducks out of sight, shy to meet them. As she sits under her window, a small yellow bird made of wallpaper emerges from a tear in the room’s wallpaper. It flies out the window and the little girl peels more of the paper away and a flock of yellow birds fly out. She peels more and a jungle-like wallpaper is revealed that she steps into. Then a yellow monster appears and the girl peels the paper away to reveal the next layer. She dashes through polka-dots then watery blue and green with frogs, then black sheep. Finally the monster stops chasing her and sits there dejected. The little girl heads back and introduces herself to him. They play together until the girl heads off to lunch. Now can she meet the kids outside? Wallpaper is a wordless story that's beautifully illustrated with paper collage art. It tells the tale of a young girl who has just moved into a new house, and is nervous about meeting the new children next door. Instead, she takes a journey into the wallpaper where she is chased by an odd yellow creature through several layers of amusingly decorated wallpaper before she realizes the monster just needs a friend. Her friendship with the imaginary creature helps give her the courage to say hello t Wallpaper is a wordless story that's beautifully illustrated with paper collage art. It tells the tale of a young girl who has just moved into a new house, and is nervous about meeting the new children next door. Instead, she takes a journey into the wallpaper where she is chased by an odd yellow creature through several layers of amusingly decorated wallpaper before she realizes the monster just needs a friend. Her friendship with the imaginary creature helps give her the courage to say hello to some potential new friends in the real world. I appreciate seeing shyness covered in a children's book, and I also liked the interplay between fantasy and reality. The different "worlds" in the different layers of wallpaper were also well done. I'm a sucker for a gorgeous wordless picture book. The unnamed protagonist has just moved into a new home with her family and is nervous to make friends. While hiding from kids in a tree house she can see from her window, she notices a tear in the wallpaper and tugs on it and out pops out a yellow bird! From there, layers and payers of wallpaper are torn away and new worlds are visited, new friends made, but after she gets, she can't get back into the wallpaper world. Instead, she ventures outsi I'm a sucker for a gorgeous wordless picture book. The unnamed protagonist has just moved into a new home with her family and is nervous to make friends. While hiding from kids in a tree house she can see from her window, she notices a tear in the wallpaper and tugs on it and out pops out a yellow bird! From there, layers and payers of wallpaper are torn away and new worlds are visited, new friends made, but after she gets, she can't get back into the wallpaper world. Instead, she ventures outside and to the tree house to make new, human friends. Our main character, a little girl, finds it too hard to talk to the kids she hears playing outside. She might be shy or have social anxiety, but either way, she finds it much easier to stay inside by herself . . . until she sees something fantastic. Under her wallpaper are layers of worlds where she can be free and play! When a monster comes after her, she learns an important lesson about courage. The art is splendid -- made of vivid collages that burst with color. There aren’t many words in this Our main character, a little girl, finds it too hard to talk to the kids she hears playing outside. She might be shy or have social anxiety, but either way, she finds it much easier to stay inside by herself . . . until she sees something fantastic. Under her wallpaper are layers of worlds where she can be free and play! When a monster comes after her, she learns an important lesson about courage. The art is splendid -- made of vivid collages that burst with color. There aren’t many words in this picture book, so the art is forced to carry the narrative, which it does effortlessly. Perfect for children who struggle with shyness or social anxiety and need to see that the world is waiting to meet them! Recommended for children 4 - 8. This is a nicely illustrated talk-about-the-pictures book. I have yet to try it out on my grandchildren, but when my children were young, a grew to dread certain books where I had to read the exact same words over and over. This could be a nice break. The adult must interact with a young child to discuss what they think is happening. I will see my 7 year old granddaughter in a few days and check it out with her. I suspect it is more appropriate for the other ones who are 3 and 5 but live in anot This is a nicely illustrated talk-about-the-pictures book. I have yet to try it out on my grandchildren, but when my children were young, a grew to dread certain books where I had to read the exact same words over and over. This could be a nice break. The adult must interact with a young child to discuss what they think is happening. I will see my 7 year old granddaughter in a few days and check it out with her. I suspect it is more appropriate for the other ones who are 3 and 5 but live in another state. Hopefully I can update this review with opinions from all three by the end of the summer. A shy girl moves into a new home, but is too shy to say hello to the children across the street. Instead, she peels back a layer of wallpaper and finds a world of imagination, mystery and the courage to try something new. Gorgeous cut paper illustrations, and a great message to kids that when moving to a new, unfamiliar place it's okay to not want to go out immediately and make friends. Sometimes you need to build up courage and be alone first. I received this ARC from NetGalley for an honest revi A shy girl moves into a new home, but is too shy to say hello to the children across the street. Instead, she peels back a layer of wallpaper and finds a world of imagination, mystery and the courage to try something new. While hiding from her new next door neighbors, a young girl escapes into the folds of her wallpaper only to meet a monster that ends up chasing her around. When the monster breaks down and cries, the girl approaches the monster to become friends--and, afterwards, finds the courage to approach her next door neighbors. Almost wordless -- there's a "Hello", a "ribbit", a "stomp", and some "blah-blah-blah"s.
The illustrations are cut paper collage. It's about a girl who just moved to town. She's too shy to talk to the other kids she sees. After exploring the worlds she finds behind the wallpaper (and meeting a monster who becomes a friend), she gains the courage to talk to the neighborhood friends. Fun illustrations that convey a strong message through just pictures. But, I had just read "The Yellow Wallpaper" with my students the same week I took this out and that tainted the whole thing for me. Especially that there is a fair amount of yellow and entering and exiting the wallpaper. Obviously, this is a much happier story! ARC COPY...Very beautiful paper cute/college style of illustrations depicting a girl who just moved in(and maybe new to country) who is shy about meeting new kids (their speech sounds like foreign bleh bleh to her), peels her wallpaper to reveal new worlds while confronting her "fear" monster at the same time. I found it to be a beautiful read. Made with paper collage images, this is an almost wordless book about a shy girl who peels the wallpaper in her room and imagines herself traveling through the different worlds she creates in each old wallpaper layer. What she thinks is a monster in a jungle turns out to be a lonely 3-eyed giant looking for a friend, which gives her the courage to go outside and play with new friends. To have friends, one must be friendly! A shy girl who hides from potential friends peels away the wallpaper in her room to discover layers of a fantasy world, and a monster who is chasing her throughout! When she stops and realizes that the monster is lonely, she says hello and makes friends- an application she then takes to the real world. I honestly skimmed this while browsing the shelves, but when i sat down and read this book, which has maybe three unique words, I was really touched! Thematically it reminds me of Fuchsia Fierce by Jones. The art is absolutely gorgeous. The only thing that would've been nice is if the group of friends were a lil more diverse shrugemoticon. Just my onion! But yes, very good. Thao Lam has been creating pictures for as long as she can remember. For her, drawing has always felt as natural as breathing. She has an insatiable love for coloured and textured papers, which she uses to create her exuberant collages. Passionate about children’s books, Thao is especially interested in visual storytelling. She draws inspiration from the stories she hears, from the beauty in everyd Thao Lam has been creating pictures for as long as she can remember. For her, drawing has always felt as natural as breathing. She has an insatiable love for coloured and textured papers, which she uses to create her exuberant collages. Passionate about children’s books, Thao is especially interested in visual storytelling. She draws inspiration from the stories she hears, from the beauty in everyday things, and from the work of the many illustrators she admires. As an art buyer for an educational publishing company, she has the opportunity to work with thousands of different artists from all around the world.